Have you ever received a gift during the holidays that you’d just love to return? Well, depression during the holidays isn’t a present that would be on anyone’s wish list. Unfortunately however, many people will suffer through a depression during what’s supposed to be the most joyous time of the year. 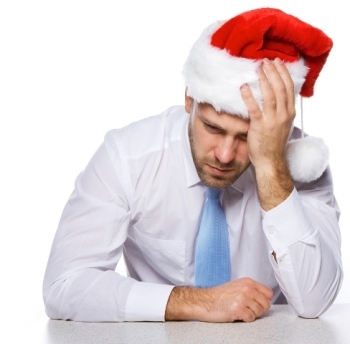 The holidays are difficult for various reasons even for those who aren’t depressed. Tis the season invites high expectations to feel certain ways and to do certain things and this can be hard, especially for the person with depression. And what’s even worse, loved ones might not understand why you can’t just “snap out of it.” This experience can make someone with depression feel lonely and isolated, leading to an exacerbation of his or her depression. It’s truly a vicious cycle. This time of the year comes with a lot of expectations, like decorating the home, shopping and wrapping, cooking and baking, cleaning, and attending holiday parties to name just a few. I bet your to-do list is a mile long. I know mine is! But for the person who’s depressed, facing these long lists of things to do feels like climbing Mt. Everest...it just seems impossible. Make things easier on yourself and shop online or give gift cards when possible. This can cut down on the frustration of driving in congested traffic, parking at malls with limited parking, and being around crowds of people who are rude and unforgiving. And if you’re on a limited budget, give gifts that are made from the heart; you can never go wrong with giving gifts that are homemade (unless it’s an ugly Christmas sweater). Learn to say no! It’s so easy to over commit yourself during the holidays, and for the person with depression, overcommitting yourself can deepen your depression. If there’s a commitment you just can’t let go, perhaps there’s a different one you can. Be flexible, plan ahead, and be realistic about what you can and can’t do. You will thank yourself later and so will your loved ones. Remember that you’re in control! You don’t have to be around people you don’t want to be around and you don’t have to stay at a party longer than you wish. The holidays are all about family and friends, and so you’re going to find yourself around people. While at holiday parties, if some of these people like to poke and instigate you, surround yourself with positive people who edify and encourage you and make you feel good. Reach out for support! If you’re experiencing depression over the holidays, make sure to communicate to your loved ones that you’re struggling to feel the “holiday spirit.” Acknowledge your feelings and reach out to others you believe will understand and provide you with support. If you’re alone, I encourage you to reach out in some way, whether that’s getting in touch with your spiritual side and going to church, attending community events, or volunteering at a soup kitchen or a toy drive. I know I always feel better when I give back to others. If you find yourself without much support, seek out a licensed therapist who can help you navigate this time of the year. Nobody deserves to be alone during the holidays. If you’re grieving over the holidays because you lost a loved one recently or in the past, remember the loved one(s) you’ve lost in positive ways. Rather than focusing on the loss per se, thinking of your loved one(s) in positive ways can brighten your mood and even make you smile. I really like the idea of celebrating your loved one(s) in some way that lifts your spirit. Creating new family traditions or doing something totally different can really be helpful in grieving the loss of your loved one(s), especially during this time of the year. Whatever you do, don’t avoid thinking about the loved one you’ve lost, that will only make you feel worse in the long run. This is a big one and the most important: take care of yourself. Make sure to eat healthily, sleep often, exercise frequently, take medications as prescribed, and be mindful of your alcohol intake. An imbalance in any one these areas can be a recipe for disaster. Eating healthily can be a real challenge with all the food and sweets available; if you splurge one day, don’t fret, just get back on track the next day. Nowadays, I don’t think we can ever get enough sleep, but during the holidays, getting enough sleep is crucial. Otherwise, your mood will likely take a dip for the worst. Also, try to get some sunshine, preferably in the early morning, given the shorter days and longer nights. Exposing ourselves to the sun can boost our mood—try it and see for yourself! Of course, you know I have to mention libations. Libations during the holidays are usually part of the menu, and my favorite is the Peppermint Martini. However, alcohol can intensify your depression and can also interact with your medications. So if you’re going to consume alcohol, do so in moderation. Compassion is going to be what the doctor ordered this holiday season. It’s the gift that should be on everyone’s wish list because it will improve your mood and help you to feel better. The best part is that you don’t have to go to the doctor to get a prescription, pick it up at the pharmacy, or worry about refills. All you need to do is to keep the following in mind: 1. make things easier on yourself, 2. learn to say no, 3. reach out for support, 4. remember that you’re in control, 5. remember the loved one(s) you’ve lost in positive ways, and 6. take care of yourself. 7. Oh, and don’t forget to breathe through it all!